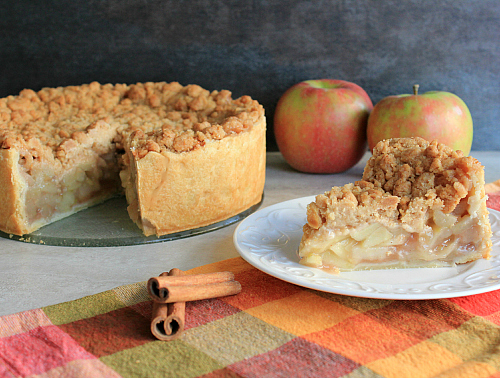 when i think of apple pie, the first thing that comes to my mind is classic apple pie with a double crust. apple pie is a must have in the fall, and after our apple picking adventure this past weekend i couldn't wait to make apple pie with the apples that we picked at the orchard. while i was reading through deb perelman's the smitten kitchen cookbook, i saw a recipe for a deep dish apple pie made in a springform pan. the only thing i typically make in a springform pan is cheesecake, so i was excited to give it a try. 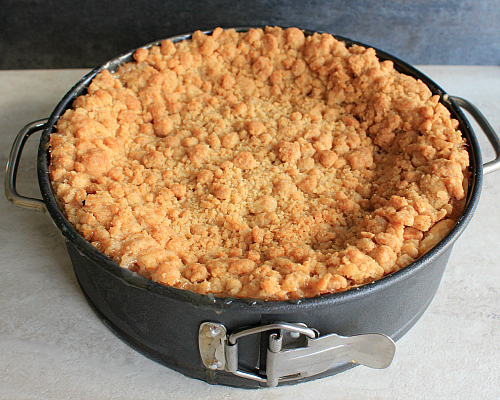 instead of covering the top of the pie with another layer of crust, deb recommended a streusel topping. i couldn't say no to that! all of that coring, peeling, slicing, and dicing, was so worth it, because the pie came together like a work of art. this pie is so worth it. it's worth the time (this guy bakes for 90 minutes!) and it's worth the calories (oh yeah, there are a few sticks of butter in there!) because it is so so good. 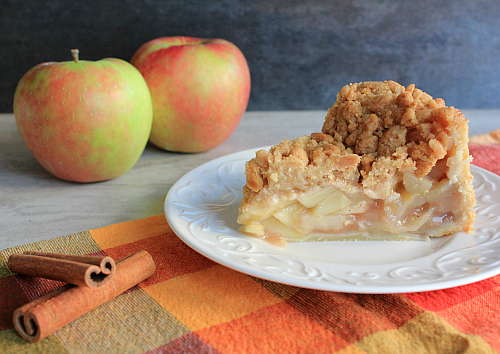 push your standby apple pie recipes aside and give this recipe a go . . . you won't be disappointed! to make the crust: cut the cold butter into one-inch cubes. in a food processor, pulse the flour, sugar, and butter cubes together until the butter is incorporated into the flour. while running the food processor, slowly pour the cold water into the mixture. as soon as the mixture forms into a dough ball, stop the food processor. remove the dough from the food processor and form it into a ball. wrap the dough ball in plastic wrap and let the dough ball chill in the refrigerator for one hour. after one hour, roll out the dough out on a floured surface to fit a 9-inch springform pan with 3-inch sides. place the dough into the pan, pressing it against the sides and along the bottom of the pan. trim off any overhanging dough. let the dough chill in the refrigerator while you prepare the filling. to make the filling: peel, core, and dice the apples into cubes, no more than 1/4 inch thick. (the small pieces will fit better edge to edge in the crust.) put the diced apples into a large bowl. sprinkle the lemon juice, sugar, flour, salt, and spices over the apples and toss well making sure that all of the apples are evenly coated. evenly distribute the apple mixture, along with it's juices, in the prepared pie crust. use a spatula to spread the apples as flat and evenly as possible in order to make sure that all of the apples fit into the crust. bake the pie for 30 minutes at 375 degrees F while you prepare the streusel. to make the streusel: stir together the sugars, flour, baking powder, and spices in a bowl. pour in the melted butter and stir until large clumps form. set the streusel aside until ready to use. after the pie has baked for 30 minutes at 375 degrees F, remove the pie from the oven. 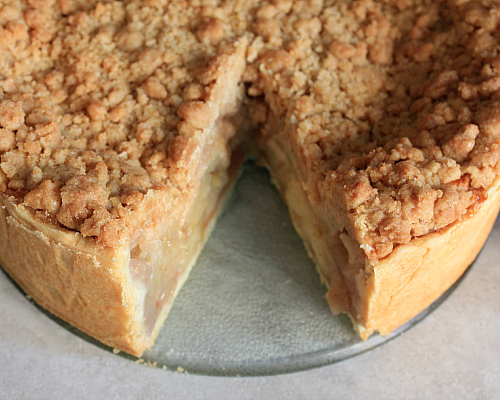 sprinkle the streusel over the top of the pie, pressing it into the apples. reduce the oven temperature to 325 degrees F and bake the pie for another 60 minutes. once baked, allow the pie to sit at room temperature to cool completely. (the pie will slice cleanly after sitting in the refrigerator for a while.) remove the outside of the springform ring and slide the pie out to slice and serve. Oh wow! That is a masterpiece. It looks like a French version of an apple pie. I will definitely have to give it a whirl. 5lbs of apples are a lot for one pie, but hearty. I wonder where this recipe orignated from? Since this is such a fancy recipe it would be nice to know the source for other recipes. I know you said Smitten but the orginal recipe. Beautiful. It really is a delicious work of art. I always love a crumble topping on apple pie. Great challenge recipe. Oh my goodness, what a gorgeous pie! Wow! 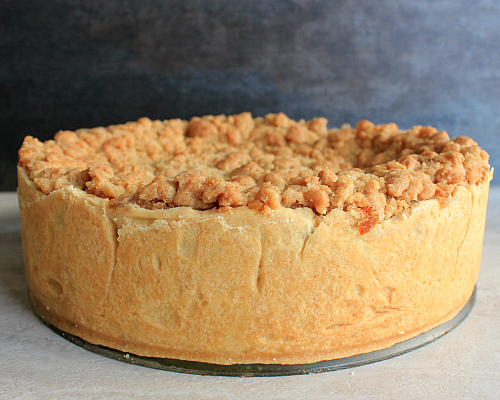 Deep dish apple pie- I never would have thought to do that, but it looks so delicious... and time consuming. I just might have to attempt this myself. Hopefully it turns out as nice as yours did! Deep dish pie? Now you are singing my tune. It looks fantastic! WOW. This looks absolutely amazing, Laurie! :) I am pretty sure my husband would die and go to heaven if I made this for him. Pinning! Oh my. that is one heck of a pie. And it looks damn delicious. What a BEAUTIFUL looking pie!!!! Just beautiful!!! And it sounds absolutely delicious!!!!! Absolutely gorgeous! This is going on my "must make" list! Great recipe! Good morning! 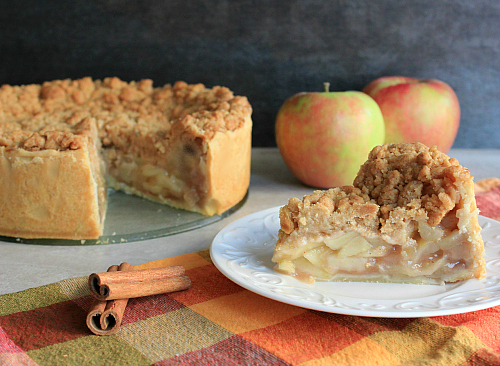 I wanted to let you know I have featured this recipe in my 15 Fall Apple Recipe Round Up! Just tried this recipe but the crust came out undercooked. Did you have any issue with this? I followed the normal baking times. This is a completely different to make pie! It really looks divine! I'm pinning it!